Thank you for joining me as we count down to the next MFT release. We are two short days away from the big day! All the new Stamps, Die-namics, and Stencils will be available on Tuesday, August 4 at 10:00pm EST. Be sure to check out the MFT Blog to see all the new items being revealed today. Don't forget to leave a comment on the MFT Blog countdown posts, YOU could win one of the five $75.00 gift vouchers. I have a couple of tropical themed cards to share with you today. 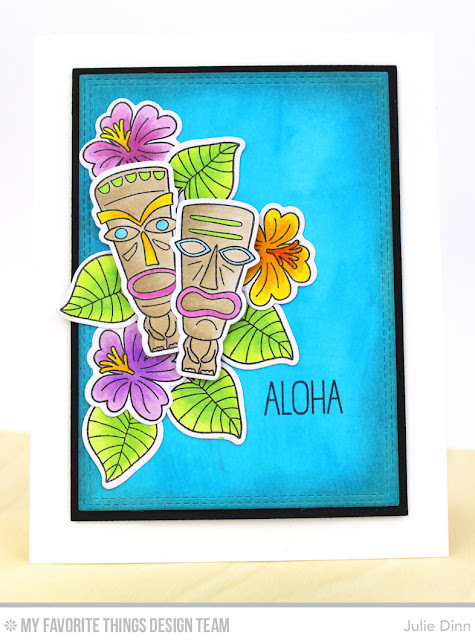 The first one features the new Tiki Party stamp set, Tiki Party Die-namics, and the Double Stitched Rectangle STAX Die-namics. I'm also using the Zig Real Color markers for both of these cards. This was my first time using these markers and I have to say, I LOVE them! I stamped all of these images on a piece of watercolor card stock and I coloured them with the Zig markers. I added a touch of sparkle to the images with the Wink of Stella pen. 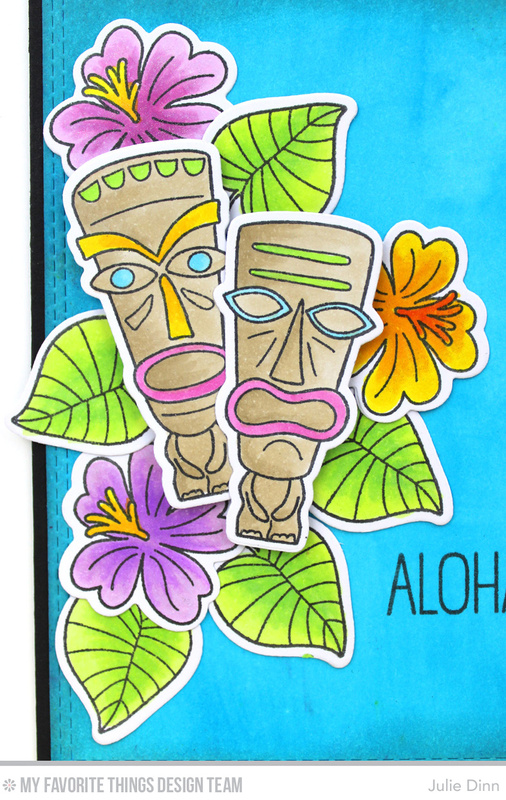 The images were all die-cut with the Tiki Party Die-namics. The Double Stitched Rectangle was also die-cut out from a piece of watercolor card stock. I brushed a few Peerless watercolors over the card stock to create the warm blue background. My next card features the gorgeous flowers from the Blissful Blooms stamp set, the Blissful Blooms Die-namics, and the Double Stitched Rectangle STAX Die-namics. 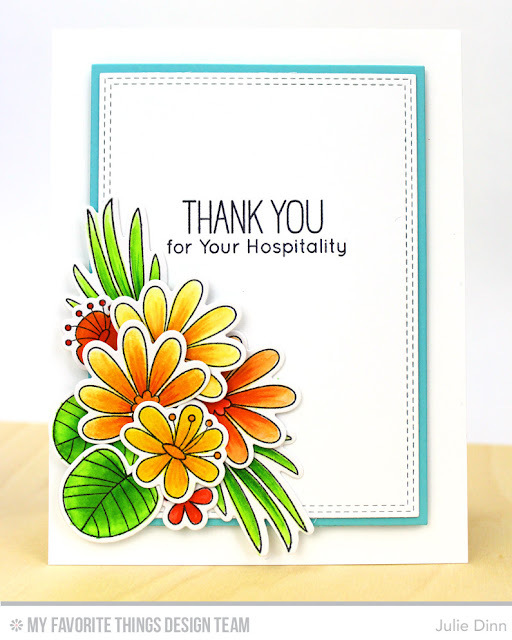 The images were all stamped on watercolor card stock and were coloured with Zig markers, and a touch of shimmer was added with the Wink of Stella pen. They were die-cut with the Blissful Blooms Die-namics. 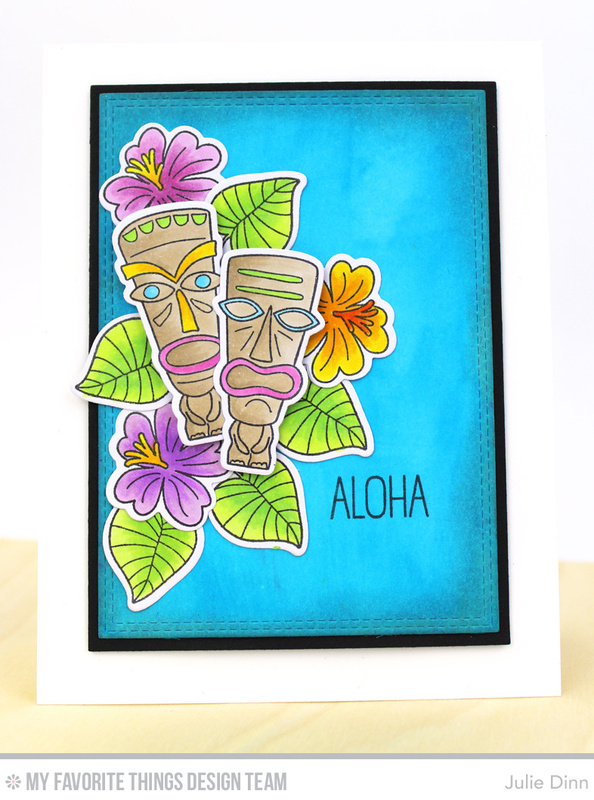 The sentiment is from the new Polynesian Paradise stamp set, it was stamped in Black Licorice Hybrid Ink. Great cards Julie. I am really liking the Blissful Blooms set! Aloha to you Too! (lol) Love how these cards just Pop on your blog. Julie, your cards are so gorgeous! 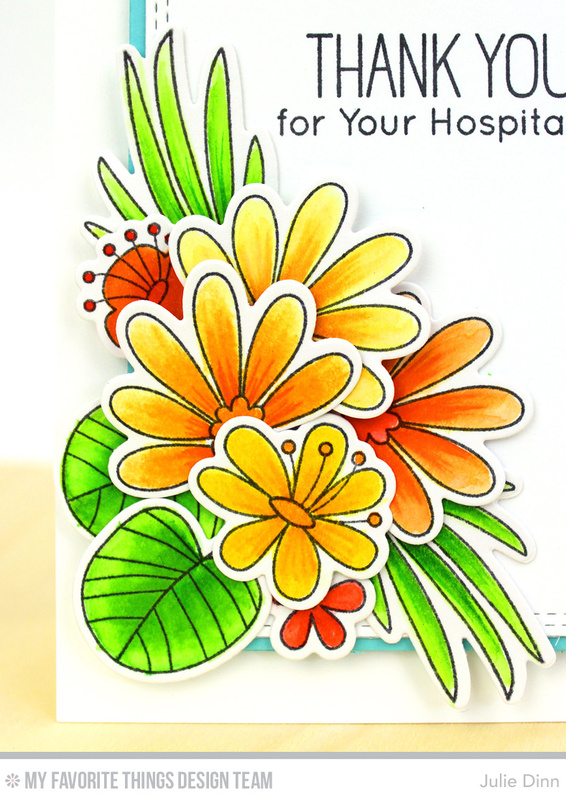 I love the background on your first card and the second is great with just the small pops of color on the white one. Thanks for sharing. Love how vibrant your cards are! These are gorgeous. Thanks for sharing! Gorgeous coloring on both cards! So pretty. I am loving all the vibrant and gorgeous coloring I'm seeing with this release. so beautiful color choice for your card!! !